Looking for a New Toyota Highlander Hybrid in your area? 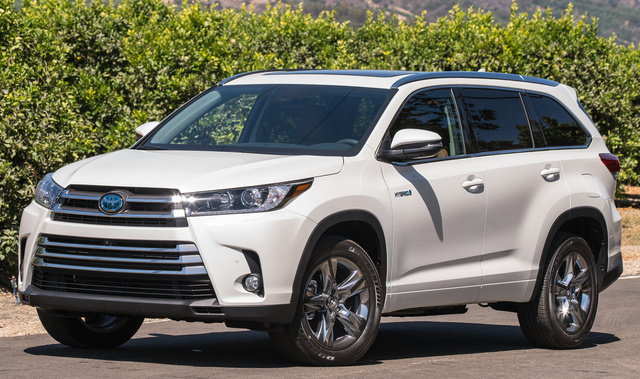 CarGurus has 1,302 nationwide Toyota Highlander Hybrid dealers with 13,798 new car listings. Midsize crossovers that seat up to eight people are easy to find. But try to find one with good fuel economy and you’ll end up with a lot fewer choices. Consider the Toyota Highlander Hybrid, which offers both features. 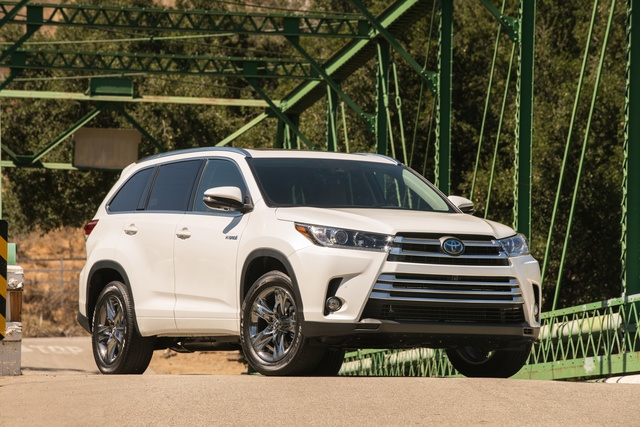 Last year, Toyota spruced up the Highlander lineup with changes to the exterior, powertrain, and safety features. Because of this, Toyota isn’t making any changes to the Highlander Hybrid for 2018. The Highlander Hybrid doesn’t look that much different from the standard Highlander. It features the same SUV profile with a bold front silver-painted or chrome grille, depending on the model, and a more aggressive front bumper. The only visual clues that tell you this isn’t your standard Highlander are blue-tinted Toyota emblems on the grille and tailgate, and “hybrid” badging on the doors. Move inside and one might think Toyota poached some ideas from its Lexus luxury brand. The Highlander Hybrid comes with an upscale interior with high-quality materials and a modern design. Controls, for the most part, are within easy reach, except for certain infotainment system buttons. Toyota incorporates some clever ideas into the Highlander Hybrid’s interior, such as a small shelf underneath the dash for small items and a massive storage bin in the center console. Comfort ranks high for those sitting up front or in the second row with supportive seats and plenty of space for passengers. The third-row seat is best reserved for kids due to the seat’s high placement and limited legroom. Surprisingly, the Highlander Hybrid has 13.8 cubic feet behind the third row, 42.3 cubic feet behind the second row, and 83.7 cubic feet with both rows folded. All Highlander Hybrids come with Toyota’s Entune infotainment system. LE models offer a 6.1-inch touchscreen, and higher trims make do with an 8-inch touchscreen, HD Radio, and SiriusXM Satellite Radio or an integrated navigation system. Entune may not be as flashy as some other systems, but it performs well. The simple interface with large touchscreen buttons and snappy performance make Entune one of the easiest systems to use. Toyota does not offer Android Auto or Apple CarPlay with Entune, but the Highlander Hybrid also includes five USB ports to charge mobile devices; the Driver Easy Speak system, which uses a microphone to allow the driver to speak with passengers in the back, and an optional Blu-Ray backseat entertainment system. Under the Highlander Hybrid’s hood lies Toyota’s Hybrid Synergy Drive system. Comprised of a 3.5-liter V6 engine with direct injection and two electric motors, this system provides total output of 295 horsepower and 263 lb-ft of torque. Other components of the Hybrid Synergy Drive system include a continuously variable transmission (CVT), nickel metal hydride battery pack, and all-wheel drive (AWD). The hybrid is slightly quicker than the standard Highlander due to the electric motors, which produce maximum power at 0 mph. The Highlander can also travel on electric power alone, but only for short distances. EPA fuel-economy figures for the Highlander Hybrid stand at 29 mpg city, 27 highway, 28 combined. Handling is what you would expect from this type of vehicle, with a fair amount of body roll and light steering. The Highlander Hybrid feature that truly shines is its ride. No matter how rough the road, the Highlander Hybrid’s suspension is able to provide a smooth and relaxing ride. Little wind and road noise enter the cabin, making this a perfect road-trip companion. In terms of safety, all Highlander Hybrids come with Toyota Safety Sense P (TSS-P). This suite of active safety systems includes adaptive cruise control, lane-departure warning with steering assist, pre-collision warning with pedestrian detection, and automatic high beams. Other safety equipment for the 2018 Highlander Hybrid includes eight airbags, traction and stability control, and a reversing camera. XLE and Limited models get blind-spot monitoring with rear-cross traffic alert. The National Highway Traffic Safety Administration (NHTSA) awarded the Highlander Hybrid a 5-star Overall rating. 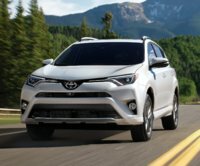 What's your take on the 2018 Toyota Highlander Hybrid? 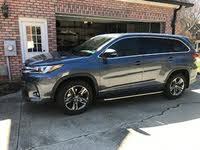 Have you driven a 2018 Toyota Highlander Hybrid? Enter your zip to see incentives for a new Highlander Hybrid in your area. I bought highlander 2018 just two weeks ago. After two weeks car has a problem so i show toyato services and they fixed and same day car has same problem, so should i get refund or exchange.